[East Asia Forum] Vietnam’s National Assembly will pass the revised Law on Anti-Corruption in the next few weeks to try to intensify the fight against corruption. This is an important move against the backdrop of widespread and enduring corruption, which has undermined the legitimacy of the country’s communist regime. For example, a 2010 report by Towards Transparency, a local anti-corruption NGO, shows that 62 per cent of ordinary urban Vietnamese citizens surveyed perceived corruption in the country to be getting worse and 18 per cent said it remained the same. Meanwhile, in 2011 Vietnam was ranked 112th out of 182 surveyed countries in the expert-polled Corruption Perception Index of Transparency International. Widespread corruption has also contributed to the poor performance of the economy over the past few years, which has caused the Vietnamese Communist Party’s (VCP) performance-based legitimacy to further decline. For example, corruption has contributed to the decline in Vietnam’s ranking in the World Economic Forum’s Global Competitiveness Report for two consecutive years. In 2012, Vietnam was ranked 75 out of 144 countries surveyed, down 16 spots from its standing in 2010. Out of eight Southeast Asian nations presented in the report, Vietnam now only ranks ahead of Cambodia in terms of competitiveness. The VCP has recently made great efforts to step up its fight against corruption. The fourth Plenum of the VCP Central Committee in December 2011 adopted a party-building resolution initiating a campaign of criticism and self-criticism throughout the whole Party to discourage Party members from engaging in corrupt practices. The fifth Plenum in May 2012 continued to focus on fighting corruption by adopting a series of initiatives, including removing the Central Steering Committee on Anti-Corruption (CSCAC) from the government’s portfolio and placing it under the VCP Politburo. This will likely make CSCAC more powerful and independent from the executive branch. Accordingly, CSCAC’s former national office, headed by Prime Minister Nguyen Tan Dung, will be abolished and replaced by the VCP’s Central Commission of Internal Affairs, which is going to be re-established. The Plenum also called for improving the legal and institutional framework around anti-corruption. The revised Law on Anti-Corruption is just one of the measures toward this end. The revised law embraces stronger and more feasible provisions regarding, for example, transparency within state-owned enterprises, public officials’ accountability, the responsibility to publicly disclose personal assets, the people’s and the media’s right to access information, and mechanisms to protect whistleblowers. A number of laws related to fighting corruption, such as the Law on Public Investment, the Law on Public Procurement, the revised Law on Thrift Practices and Anti-Wastefulness and the revised Land Law, have also been put on the National Assembly’s agenda and are likely to be passed in its upcoming sessions. In another attempt to hold high-ranking officials accountable for, among other things, corruption within agencies under their portfolios, the National Assembly will also pass a resolution in November to establish policies and procedures for casting annual votes of confidence on key post holders who are elected or approved by the National Assembly and People’s Councils. These measures indicate the VCP’s strong desire to strengthen its fight against corruption, but whether the VCP’s attempts will be successful is still unclear. Political will is not enough to make the fight against corruption effective. Instead, the VCP’s efforts will depend largely on the efficiency of the law-enforcement system, especially corruption-fighting agencies. The efficacy of Vietnam’s law-enforcement system is, however, closely related to the nature of its political system. In a single-party system, the independence of the judiciary and of law-enforcement agencies — key requirements to make corruption fighting effective — is hard to guarantee. The tight controls placed on media and civil society also prevent them from fully contributing to the exposure of corruption. Against this background, the VCP’s chances of stamping out corruption are low. The VCP’s decision to put the CSCAC under the Politburo, for example, may be a merely symbolic move. After all, it is difficult for the Party to eliminate and punish its own corrupt members, especially when these segments form the upper hierarchy of the Party. 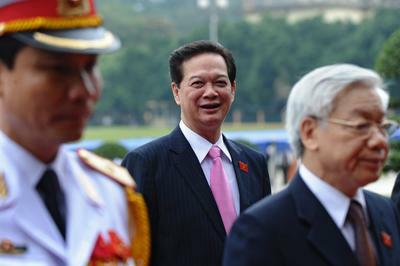 The move also makes Vietnam’s political system less transparent and less efficient because it strengthens the Party’s administrative and law-enforcing powers at the expense of the government and law-enforcing agencies. If the Party wants to make its fight against corruption more successful, it may have to consider more radical measures. However, as maintaining the Party’s unchallenged rule remains its top priority, it is almost impossible for the Party to adopt such radical measures as rendering the judicial system independent, liberalising the media or allowing the establishment of opposition parties. Consequently, the Party is facing a paradox: insufficient efforts to fight corruption will be detrimental to the Party’s legitimacy and its rule, but the radical measures necessary to reduce corruption could backfire on the Party. As long as the current political situation in Vietnam persists, pervasive corruption in the country is likely to continue despite the VCP’s efforts to prevent it. Le Hong Hiep is Lecturer at the Faculty of International Relations,Vietnam National University, Ho Chi Minh City, and is a PhD candidate at the University of New South Wales, Australian Defence Force Academy, Canberra.